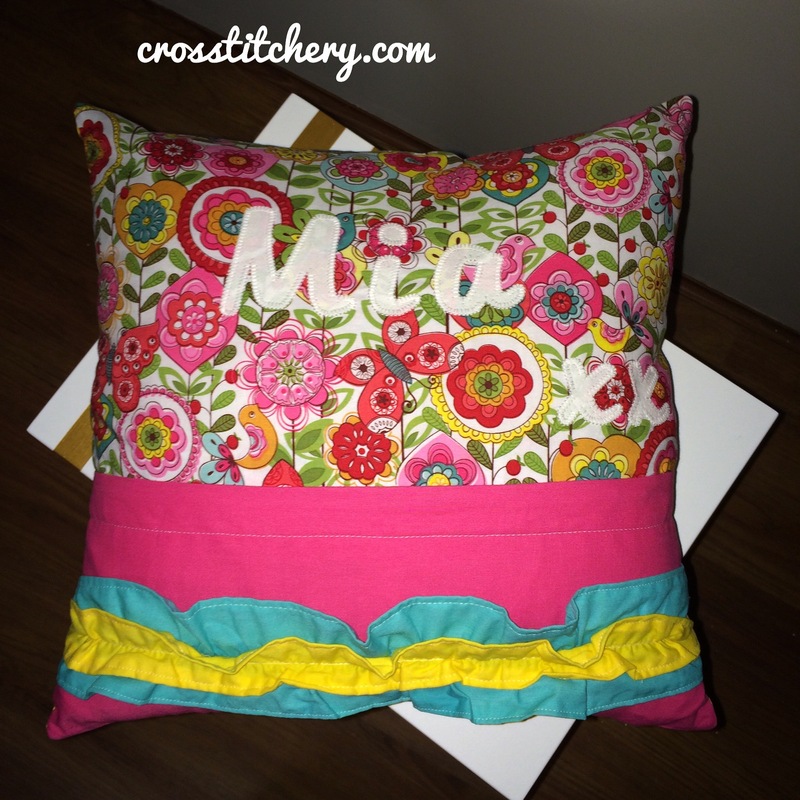 Just wanted to share some photos of my latest completed commission; a personalised, applique cushion for a 4 week baby girl named Mia. My client allowed me to play around with colours, and only requested that the design was girly. I think the double ruffle feature on the back gives it a girlish pop, and I just really love ruffles! She particularly loves the ruffles, just like me. Creating the ruffles was so much easier than I originally thought. I was actually inspired for the ruffles due to a little mishap I had with my sewing machine. I usually leave my sewing machine uncovered on my craft table. At some stage between finishing up my last sewing session and starting my new one, the tension had been dialed all the way up, so when I started to sew, my fabric pulled due to the high tension, thus creating a ruffle. 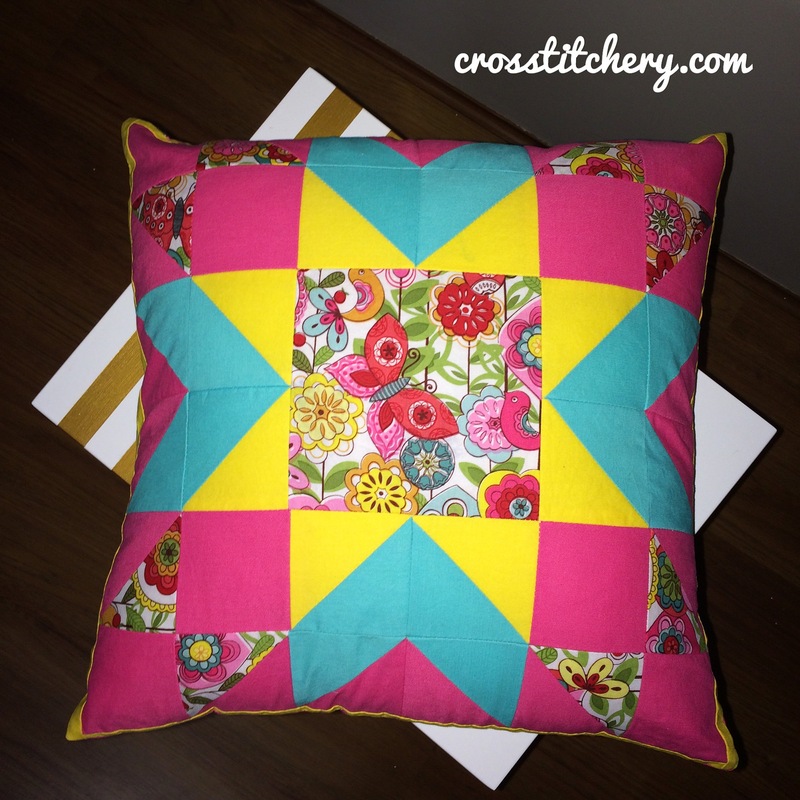 This cushions is 16″ completed, so I cut my blue fabric at 4″ wide and 20″ long. The 20″ was to allow for the bunching that occurs whilst creating the ruffle. If I had of cut it at 16″ the final piece would’ve been too short due to the ruffle bunching up. I then folded and pressed the raw side at about 1/4″, and then folded and pressed again so the raw edge was contained so as not to fray. I then top stitched each of these sides to hold the raw edges. I drew a line down the middle of my strip of fabric, then dial my tension right up (to 9), and used a basting stitch length (5.0) on my machine, and my sewing machine basically did all the work. I made sure I didn’t back stitch at either end though, otherwise I wouldn’t have been able to pull the thread to make it more or less ruffley. Once I was happy with the amount of ruffle, I pinned it to my cushion back, changed my stitch length to 3 (normal for me), and returned my tension to normal, and then sewed down the basting stitch. With this run, I did back stitch at either end. I was thinking of making a little photo tutorial of this, in case you’re reading along but you’re more of a visual leaner like I am. If you’d like that, let me know and I’ll take photos as I go along for my next cushions that I stitch a ruffle on. I won’t post it if my written directions above are easy enough to understand! Love this!! So much fun! !